So Abraham rose early in the morning, saddled his donkey, and took two of his young men with him, and his son Isaac; he cut the wood for the burnt-offering, and set out and went to the place in the distance that God had shown him. On the third day Abraham looked up and saw the place far away. Abraham took the wood of the burnt-offering and laid it on his son Isaac, and he himself carried the fire and the knife. So the two of them walked on together. Father Sacrificed Child. God Told Him To. So accustomed are we to horrendous tales of domestic violence that this headline might seem only a bizarre twist on the ordinary. People who read about he incident over their morning coffee noted it, registered a reaction, and turned the page, muttering, “The man must be crazy.” In this way, the man was defined, the deed was labeled, and the whole thing could be put out of mind. A year later, when Cristos Valenti came to trial, only one of the jurors remembered the newspaper story. Yet once upon a time, God asked another father to sacrifice his child. For his willingness to obey God’s command, Abraham became the model of faith at the foundation of three monotheistic (Abrahamic) religions: Judaism, Christianity, and Islam. His story has been inscribed on the hearts and minds of billions of people for millennia. P. 5. We are working our way through the myths of Genesis. These are the foundational myths for Western culture, not just Christians or Jews, but Muslims too. Not just Bible believers or religious people, all of us, secular and religious. These are the myths that are so pervasive that they rest in the marrow of our bones. They are so central that we may think they are natural in regards to issues of gender, authority, and power. They are not “natural”. These myths have been constructed. The views and vision they propagate regarding men, women, children, fathers, and God, were created and constructed by human beings in a particular way. They are not universal to all humanity. They are not what “makes us human”. Not all cultures have shared this vision and these views. If they can be constructed, they can be deconstructed. The via negativa, the spiritual path we have been honoring during the season of autumn, is a path to God that says, “God is not this.” One of the ways to approach God is to say what God is not. This is a way of spiritual growth because it invites us to dismantle images of God that no longer work or are no longer true for us. The via negativa is the way of letting go. We let go of ways of thinking or believing that are no longer life-giving. This gives us the opportunity for creativity. After letting go, we can create. We can create new images for God. I am using the phrase “image of God” as a metaphor for creating meaning and morality. This is certainly a secular work as well as a religious one. I don’t mean to suggest that we can just decide tomorrow to create new myths and new images for God. That is a much longer process and it is something that is done collectively and it is something that arises from creativity. We can give ourselves permission to begin. The via negativa or in this particular case of analyzing myths, deconstructing, is not saying that we need to discard these myths or stop reading them. I think it is the opposite. We need to read them carefully. We need to read them with awareness of their cultural and historical setting. We need to read them with awareness of their agenda and of their assumptions. We need to read them with awareness of the effects that they have had upon us and continue to have. They have power. Part of their power is that they are assumed to be sacred or holy in a way that other stories and myths are not. These stories come from the Bible. We place them on a brass stand. We use phrases such as “Word of God” or “Authority of Scripture” and we are instructed not to question them. We are told not to analyze their assumptions. We are told not to challenge their view of God or their morality. We are simply told in the words of the childhood hymn, whose chorus I know by heart, “trust and obey”. Trust and obey, like Isaac trusted and obeyed his father. Trust and obey like Jesus who obeyed his father and went to the cross never saying a mumbalin’ word and died for the sins of humanity in order to satisfy his father’s honor and need for blood revenge on sinful humanity. All in love, of course. Before trusting and obeying perhaps we ought to see if this image of God is worthy of trust and obedience. There is a difference between the god who is a character in a biblical text, the god of theological reflection, and the god of personal experience. They interact, but they are not the same. Just because God does something in the Bible, like tell Abraham to kill his son, that doesn’t mean that the character, God, is the God we need to trust or obey. Abraham didn’t tell his wife and he lied to Isaac. Well, that is the truth as the story turned out, but you and I know that is a lie as Abraham didn’t know. If he knew then his near-sacrifice wasn’t an act of faith at all. He was simply calling God’s bluff. The point of the story is that Abraham was willing to kill his son for God. That is why he is honored as a model of faith. You may be sensing that I am disrespectful and irreverent regarding Holy Scripture. You are right. This is a text of terror. We dismantle bad texts by removing their halo, their supposedly deserved reverence. The problem with these texts are not the texts but the aura of sacredness we place around them. The unquestioning authority of scripture. I remember my seminary experience of hearing explanation after lame explanation supposedly justifying Abraham. One explanation is that this is a story that ends child sacrifice and substitutes animal sacrifice. God did provide a ram, after all. There are a couple of problems. Isaac did ask about a lamb. So there already was a tradition of animal sacrifice even within the story itself. Or…God could have simply declared that child sacrifice was wrong, as is done in other texts. Or…Abraham could have refused the command and on his own told God, “No, you get a ram instead.” Then Abraham would have been a true hero. The point of this story is that Abraham is a model of faith because he was willing to kill his son. Abraham’s faith is what we are to emulate. Christians have taken this story as prefiguring the sacrifice of Jesus by his father. In that case, the divine father carried it out with the divine son's acquiescence. Some have said this story is not about killing his son, but his willingness to give up what is most valuable to him. Giving everything to God, even his most valuable possession, his son, is the faith we should emulate. We ought to be willing to give up everything to God, just like Abraham. OK, except that Abraham didn’t give up everything. He didn’t give up his wealth, for instance. He didn’t even bargain. He had bargained with God over the fate of Sodom and Gomorrah. Remember that story? The point is that Abraham was willing to bargain with the Lord for Sodom and Gomorrah. But when it comes to his own son, Abraham doesn’t raise an objection. He doesn’t say, “Take my stuff, instead!” He doesn’t say, “Take my own life.” He just does what God asks without saying a mumbalin’ word. The next problem we have is the notion of possessions. Is Isaac Abraham’s to sacrifice? Where did we get the notion that Isaac was a possession of Abraham? If a possession, does Isaac not belong to Sarah as well? 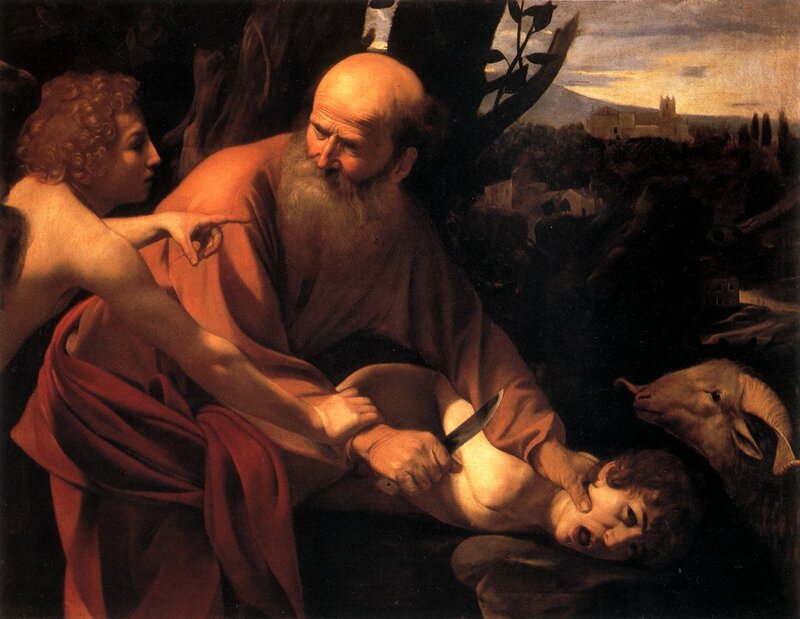 The story assumes that Abraham owns his son in a possessive sense, in a way that Sarah does not. This is the major insight of Carol Delaney in her book, Abraham on Trial. What is assumed in this story and not questioned by the authors is a theory of procreation. That theory is what gives patriarchy its power and gives monotheism its vision. It begins with the word, seed. Isaac is Abraham’s seed. He is not Sarah’s seed. Sarah is the ground that nurtures the seed, but she does not provide seed. Abraham’s seed is the spirit, life, soul, and identity for Isaac. Isaac as the seed of Abraham belongs to Abraham. Sons and daughters belong to fathers in ways they do not belong to mothers. In a patriarchal and patrilineal understanding of procreation, the seed of the father is passed down. This is seen in the Christian myth of the virgin birth. The seed is God. The Word, the Divine Seed, is passed through Mary. Mary does not contribute anything to Christ's identity. He is not defiled by Mary because she is the ground, the womb. She is not a co-creator. The point of that myth is that Jesus is born of virgin and therefore divine, not sinful. If Abraham kills Isaac, his seed, he is killing himself, according to this theory of procreation. Killing his son, or killing “himself” is killing the promise of the great nation that Abraham will fertilize with his seed. The land, the ground, is feminine, like the womb, ready to be planted with the seed of the father in order to build a great nation. That is the lifeblood of patriarchy. We have vestiges of this in our modern secular society. We see it in marriage rituals where the father “gives away” the daughter to another man. We regard it sentimentally today, but marriage, the holy sacred institution that our conservative friends wish to protect, is a legacy of a patriarchal property exchange. Children, and the rare exception proves the rule, take the father’s surname as does the wife. In fact, I still hear even in my own family that “the line” is not continued unless sons are born to “carry on the name”. The name is the seed. If you have daughters some other man is going to plant his seed and that seed will populate the land, not yours. Even though we know the science of procreation, that both mother and father contribute genes to the child, it has not changed in our cultural and religious understanding of gender roles and parenting roles. The myths are powerful and resilient. Abraham is faithful because he is willing to kill his own seed. Poverty. Punishing disobedience is the legacy of our patriarchal God. We would rather spend our money on prisons than on education, food, or housing for single mothers who raise their children after some father has sown his seed. We are stripping away the social net for women and their children and justify it with the mythology of the “welfare mother” and blame the victim. We would rather punish these women and their children rather than help them. War. Did you know that November 11th, 1918 was called Armistice Day? It was the day that honored the end of the war that would end all wars. It was a day that acknowledged peace. This war to end all wars eventually came to be known as World War 1 because there was a World War 2. The war to end all wars didn't. It wasn’t until 1954 that Armistice Day became Veterans Day. I support veterans. I support them so much that I advocate ending needless wars and paying for providing for the emotional and physical needs of veterans who have been permanently damaged by these wars. Kurt Vonnegut from his 1963 novel, Cat’s Cradle. We have created a war mythology not far removed from Abraham’s legacy that advocates sacrificing our children for the honor of the fatherland. We instill this mythology in our children at a young age through war games and constant flag waving. We communicate to them and to all of us that war is the most important and noble thing we can do. Don’t question. Trust and obey. I have given you a negative reading of this myth of sacrifice. But I want to leave you with a positive message. That message is that we are not beholden to this myth. These patriarchal stories are not all there is to say about God and about faith. I am not saying that you have to agree with all of what I have said or with anything for that matter. But I do invite you to think about it. We can, if we choose, in the spirit of the via negativa let these stories go. We do not have to defend the god of these texts or the faith of the other characters. We can read them critically. If we choose, we can give ourselves permission to remove the haloes around texts that are no longer sacred and challenge their assumptions. We can honor the Bible for what it is, a collection of writings written and compiled by limited human beings. But we have new stories to share. In particular, we need new stories and we need to celebrate old stories that serve to honor equality, sustainability, peacemaking, and protection of our children. I think a practical way of doing that is to acknowledge that each of us has a loose-leaf bible. Whether that bible is literal or metaphorical, it contains stories, poetry, and knowledge that is meaningful for us. What if we began to call our loose-leaf bible sacred scripture? With that we move from deconstruction and the via negativa to the joyful life-long project of the via creativa, the way of reconstruction. "Think of what a paradise this world would be if men [and women] were kind and wise. I needed this today. I struggle with "Veteran's Day" more and more every year. We came home from a great and much needed weekend trip just to hear it - and I am so glad we did! The trick is not to deconstruct the myth; that's the easy part. The hard part is getting the myth completely and totally out of our minds. Thanks again to my favorite heretic! Until now, I have never heard or read a sermon on the Abraham/Isaac story that was remotely satisfying. The contortions performed in public to justify this one put any other side show to shame. I have to believe there are lessons to be learned from most of scripture, but this is one of those it just might be best to forget about. It's not like it would be unprecedented. How often you hear denunciations of eating shellfish from the pulpit? The thing about this text is that it is central to the Abrahamic religions and thus can't be ignored. John, my problem with your point of view, and that of your commentors, is that none of you read the text in the context of the tradition. The Bhagavad Gita is literally an exhortation of Krishna to Arjuna to slaughter his relatives, teachers and benefactors in a fratercidal war. Nevertheless, no educated Christian or Hindu thinks it anything other than a highly-exaulted spiritual discourse. Like Gandhi, we know how to read it, how the tradition takes it out of the literal. I am therfore sometimes puzzled that modern Christians, who have no difficulty reading texts like the Gita as calls for renunciation, discipline, and compassion, have such difficulty seeing the texts of their own religious heritage in the same way. I think you bring up a good point. Should I give the Gita a pass? Maybe not. I understand how I am supposed to interpret the Abraham story and the tradition. I get that. Emulate the trusting faith like Abraham in God who keeps the promise. You can trust it even to the point of sacrificing it. The story is more than an eternal, essential message of faith in God who delivers on his promises. The assumptions behind the story regarding gender and power have their effects. This myth was created in the context of patriarchy and as such is a patriarchal message.